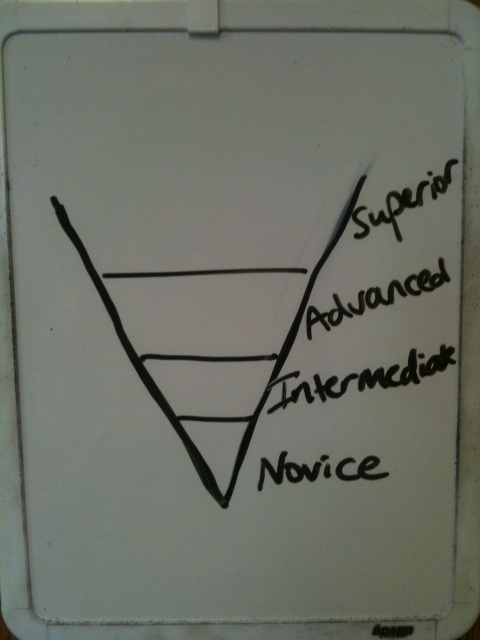 In language learning, there are various images that capture the experience of moving from novice to advanced/superior. Some people like to look at it as a cone. At the bottom of the cone, when you are getting started, you can fill up the bottom 1/4 fairly quickly. If you add just a little bit of language, you will see big leaps forward. Suddenly, you know the word for cat (el gato), and house (la casa), and a whole host of vocabulary that you can use to label everything in your home. Suddenly, you can introduce yourself, tell someone where you are from, and maybe even order a beer. Compared to how much of the language you knew before you started filling your cone, there is a sense of satisfaction. Especially if you can say “quiero una cerveza grande,” and it arrives pronto. Now that the bottom 1/4 of the cone is full, the difference between the bottom of the next 1/4 to the top of that 1/4 (Intermediate in visual above), is not that much. It also takes much more language learning to fill that part of the cone. As you move up the cone, the change is gradual, and requires more and more knowledge and experience to fill a section. Notice the Superior level is open because this is a continual effort that one must make to remain a superior speaker of a language. The kicker is that Superior does not equal native speaker. Not all native speakers are at the superior level in their own language. I am currently in the Intermediate section of the cone in Spanish, attempting to be solidly in the Advanced section by the end of this academic year. This will take work and patience. I have to remind myself all the time that this is where it gets tough, this is where many people give up because the progress is too slow to feel good. Instead of celebrating the fact that I can follow a lecture in Spanish on the subject of the farming industry in Uruguay, I am frustrated that I can’t explain in Spanish what effects the birth rate, unemployment rate, and immigration rate have on the Spanish economy when I am asked to do so in class. It’s very hard to move from the labeling and basic conversation stage into expressing abstract ideas or presenting an argument about an issue.